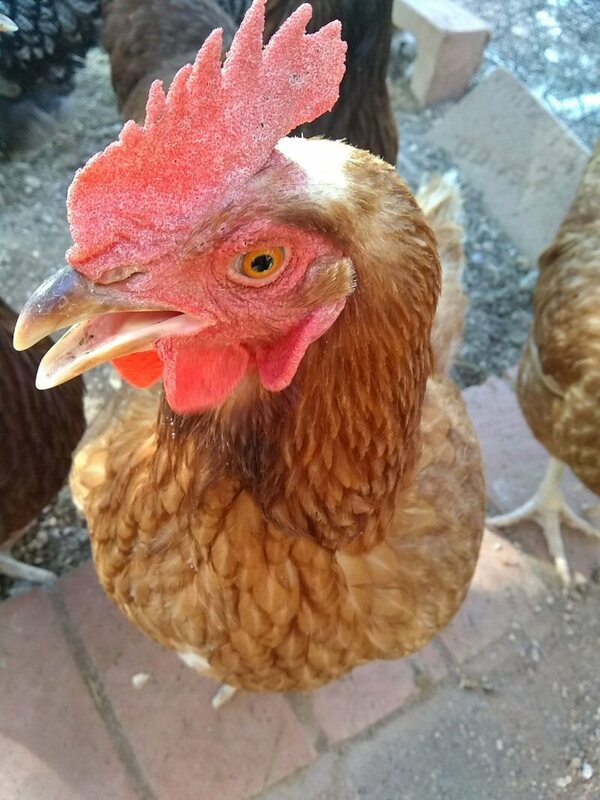 Henrietta lives in Tucson and approves of this page. Thanks to Hadrien for the conversation that started this page... and his EM analysis. Chicken dots appears in our microwave slang dictionary. The origin of the name is not clear, we think it has to do with an engineer being "chicken" that his/her design won't work. It might be a reference to "goose bumps". If anyone has an opinion, clue us in! The equivalent means of tuning a waveguide structure is known as "dent tuning". Can you guess the origin of that name? 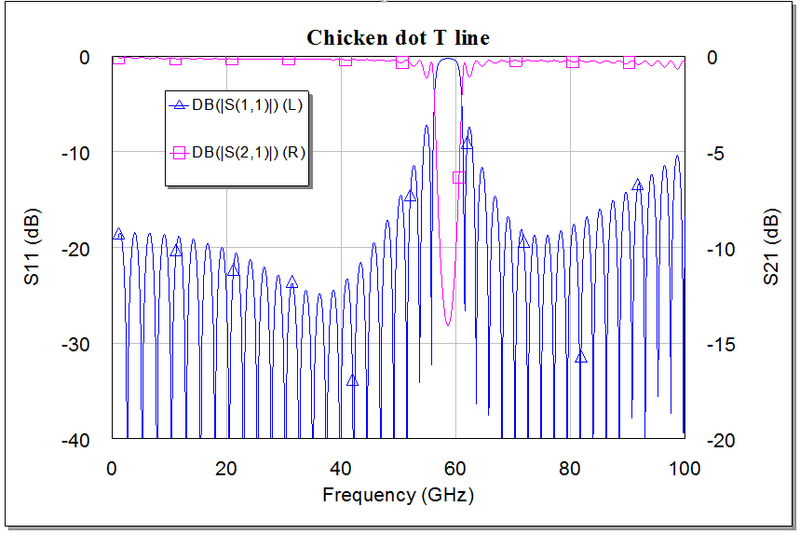 Chicken dots are used in microstrip circuits, as a means of modifing circuit performance after the circuit is built. They can be used on soft substrates employing SMT, or chip-and-wire construction. Maybe we should say "chirp and wire?" 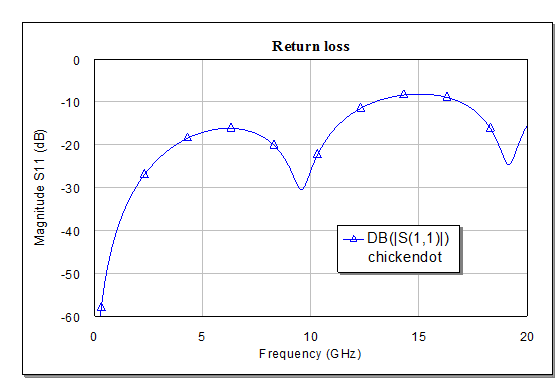 The need for chicken dots was much higher before modern EM analysis software made circuit design more accurate, way back in the 1980s. However, there is still a ton of uncertainty in S-parameters of active circuits, so you should consider ways of tuning a circuit without the expense of a second design iteration. 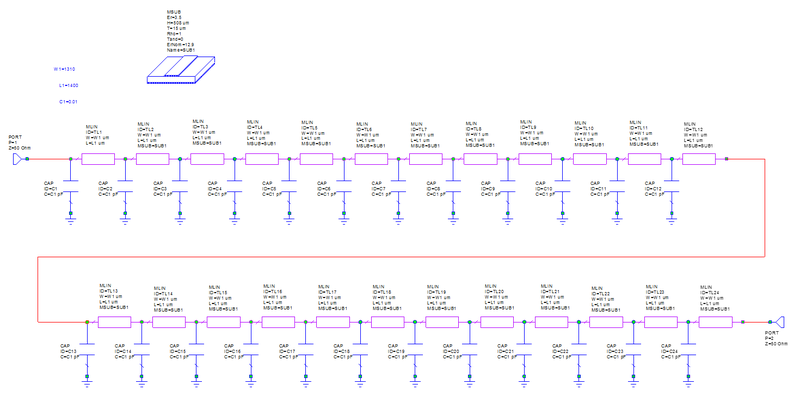 Each dot could add somewhere between 10 and 50 femto-Farads, normally they are disconnected from the circuit and hopefully don't have a major effect on the intended performance more on this later). You can also think of chicken dots as future open-circuit stubs. And you can locate chicken dots on the end of an open circuit stub, to extend its length. Unfortunately, there is no practical way to chicken-dot a shorted stub, except perhaps as a way to change its width (and impedance). In the ciruit below, there are many dots, but none of them are being used. Better safe than sorry! The tuning procedure is typically done with a tuning stick (sometimes called a "diddle stick"), made from a sharpened wooden stick such as a high-end cotton swab (not the cardboard ones you clean your ears with... come on, admit it, everybody does this). The stick is sharpened to a small square on the end, then a piece of copper is applied to just the tip. You can buy sheets of copper with adhesive backing from DigiKey or even Amazon, it has lots of uses, especially for EMI shielding, and even the "C-word" (crafting). Putting chicken dots next to a wirebond will allow you to tune out its inductance by trial and error. It will also drive your assembly people mad, as you will be trying to tune right on top of a delicate wirebond. If you place a dot 1/2 wavelength away from a wirebond, you can still tune out its inductance. In the image below, the "dot" is represented by a tiny capacitance, and the wirebond is represented by 0.2nH inductor. The dot is not yet connected. The return loss gets worse with frequency, as the inductance moves toward an open circuit. Now we connect the dot at 1/2 wave away from the wirebond. A simple low-pass network is formed. A little tuning causes a narrow-band improvement, which is sometimes all you are looking for. Thanks to Hadrien, we have an EM analysis of a wide field of chicken dots. Is it possible to over-do the use of chicken dots so that you regret you ever heard of them? Maybe, but not likely. Below is a fifty ohm line, with no dots. 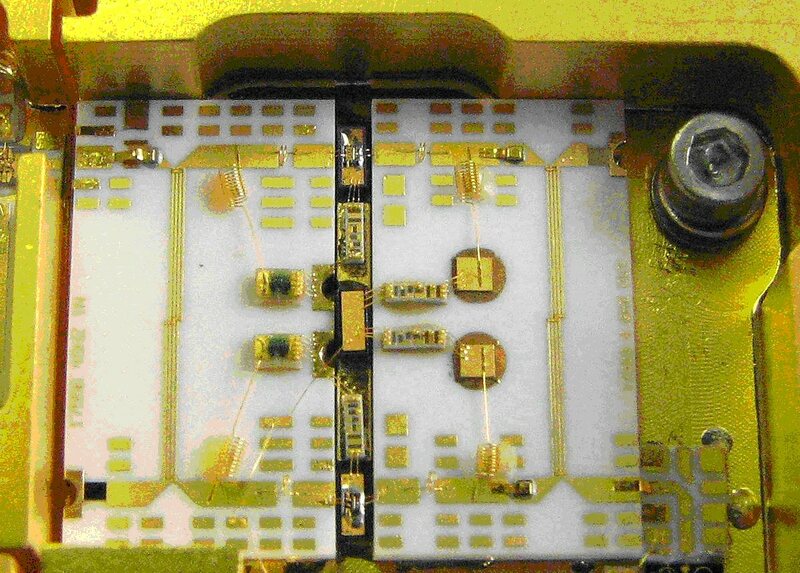 It is Rogers RO3003, with DK of 3.0, pf a 0.508mm thickness (20 mils for Americans and the other two countries that are not metric...) Following Microwaves101 Rule of Thumb 13, this media should be useful to ~35 GHz (where it is 10% of a wavelength tall). Note that for a staight line, the rule of thumb is always pessimistic, it keeps on working to 60 GHz. The problem will show itself when you add bends to the line, or try to RF probe it using grounded vias.... or just look at it funny. And here it is with dots. A lot of dots. Length is 1000um, width 400um and spacing 400 µm. Two rows on each side! What can you say about the performance with the chicken dots? Not much of an effect until 30 GHz. Note that if you looked up even higher in frequency, you would observe a Bragg frequency limitation. This is where the periodic effects of the chicken dots (or any periodic discontinuity) are spaced 90 degrees apart. The Braggs (father and son) are in our humble Microwave Hall of Fame. Below, we made a crude linear model of Hadrien's chicken-dot T-line. The dots are modelled as tiny capacitances, 10 femto Farads. You could argue that they should be modeled as coupled structures, but for this simple demonstration of Bragg frequency it doesn't really matter. You could add more dots if you wanted, we were lazy. The predicted performance is shown below. At around 60 GHz, there is a dip in S21 and a peak in S11, just as Bragg predicts. Note that you can operate above the Bragg frequency, in theory. Send your comments to UE@microwaves101.com.